Berkeley Rep's staging of the Scottish Play is visually striking but emotionally tedious. 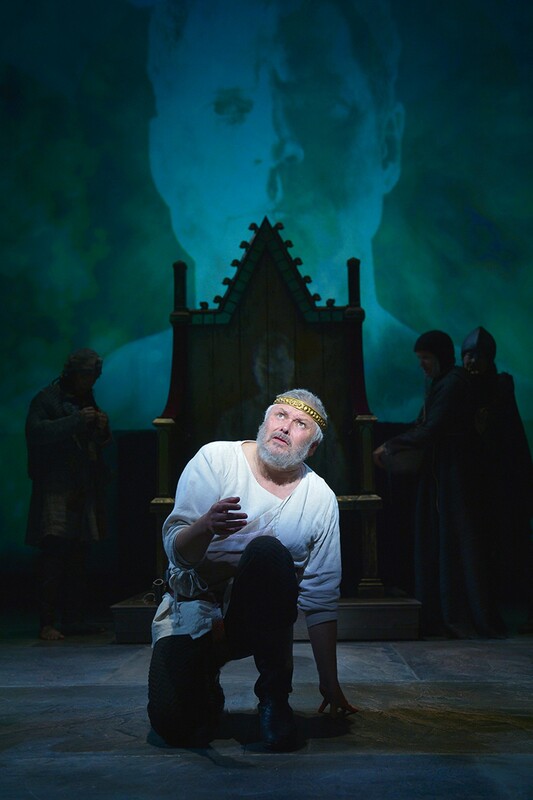 Macbeth is now playing at Berkeley Repertory (2015 Addison St., Berkeley) through April 10. $35-$145, BerkeleyRep.org. For modern audiences, there are few surprises in Macbeth, Shakespeare's study of the corrosive nature of unchecked ambition. Even so, the play continues to intrigue audiences as a grim psychological portrait of Lord and Lady Macbeth, who, motivated by a shared desire for power and the seemingly favorable prophecies of a trio of witches, plot and murder their way to the Scottish crown. 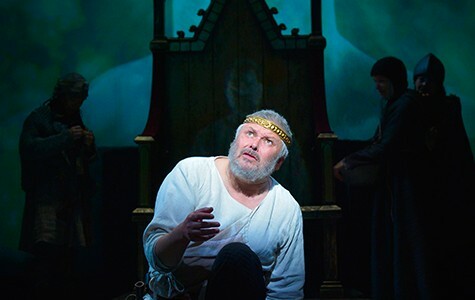 Director Daniel Sullivan's rendition of the tragedy, now playing at Berkeley Repertory (2015 Addison St., Berkeley) through April 10, attempts to capture the urgency of the script's ever-changing political and emotional terrain. But, despite its technical savvy and star-studded cast, the production lacks necessary emotional resonance at times. Overall, Sullivan's cast tends toward meekness in the portrayal of their characters. For instance, Macbeth (Conleth Hill) so convincingly lacks resolve that it's difficult to discern whether the character is truly interested in gaining political power or merely has an appetite for praise. Similarly, Lady Macbeth (Frances McDormand) is far from the cruel seductress that she is often portrayed as. Instead, McDormand depicts her as a matronly figure who, perpetually harried and plainly dressed, must compel her husband to commit the gruesome acts he lacks the courage to carry out. In this staging, unlike others, Macbeth and his wife don't share easygoing sexual chemistry, though that appears to be an intentional choice rather than a misstep. Instead, Hill and McDormand play the duo's union as a longstanding and long-suffering one, devoid of physical intimacy but presumably propelled by a shared lust for power. Unfortunately, this lust never fully materializes for either character. Without a clear sense of why Macbeth and, to a lesser extent, his wife, crave political control in the first place, the couple's emotional upheaval following the murders they commit is less engrossing than it could be. Although Sullivan's Macbeth is set in the play's typical medieval time period, the production boasts frequent digital projections by video designer Alexander V. Nichols. These images — the best of which include ominously churning storm clouds, a ghastly crimson moon, and a variety of architectural tableaus — are especially effective when mounted against scenic designer Douglas W. Schmidt's vertical panels, which are covered with tattered, mummy-like gauze and offer a metaphor for the play's decaying moral atmosphere. Some projections, like a moving black-and-white forest or a set of large, Oz-like faces that is summoned by the three witches in the fourth act, are technically impressive, but seem too cinematic for the otherwise historically faithful production. The production is at its best when it deals with supernatural interventions, as in the riveting opening scene in which the three witches (Rami Margron, Frances McDormand, Mia Tagano) gather around a flayed soldier and recite their hex-like incantations. Lady Macbeth's sleepwalking scene, which contains the famous "Out, damned spot!" soliloquy, is similarly unsettling and also undeniably powerful, as McDormand performs the monologue in a state of catatonic terror that leaves no doubt as to how deeply disturbed her character has become. Though the play picks up fantastic momentum at the end of its first half, that energy tapers off after intermission and never fully recovers. Instead, much of the production feels like a slog through two hours of dense material while certain scenes, like the banquet at which Macbeth is haunted by the ghost of Banquo (Christopher Innvar) — a nobleman assassinated on Macbeth's orders just one scene prior — would be well-served by additional stage time. Though it isn't ruinous, the production's tepid pacing flattens even otherwise commendable performances by members of the supporting cast. Malcolm (Adam Magill) is Macbeth's entirely mild-mannered successor and seems almost as young and naïve as Macduff's (the compelling Korey Jackson) beguiling young son (Leon Jones). Bay Area theater veteran James Carpenter juggles the roles of Duncan, Porter, and Doctor with ease, while Lennox (Scott Coopwood) and Ross (Billy Eugene Jones) are also dignified presences on the stage. At the play's end, Ross reunites with Malcolm and Macduff, who have fled to England from Scotland. Gloomily, Ross updates the pair as to the state of their homeland. "Alas, poor country!" he exclaims. "Almost afraid to know itself." If only the actors in this staging seemed adequately afraid of their characters and the horrible acts they've committed. While Berkeley Rep's Macbeth does much to set the gruesome scene, it sometimes skims over the tremendous depth the play has to offer. Ubuntu theater's latest production, The Gospel of Lovingkindness, explores the relationship between gun violence and systemic inequality.